WELLINGTON, New Zealand (AP) Head coach Steve Hansen says the All Blacks are not dirty but the team’s discipline and propensity for making high tackles is likely to come under scrutiny in Saturday’s second test against France. New Zealand won last weekend’s first test 52-11 and Hansen, naming an unchanged lineup for the first time in three years, has focused this week on improving on that performance and winning the three-test series. But he has been forced again to defend his players over an ugly incident in the first test in which France winger Remy Grosso sustained a double skull fracture. Grosso, who has since returned to France, was pinioned in a dual tackle by All Blacks flanker Sam Cane and prop Ofa Tu’ungafasi. Cane hit the winger around the neck with a swinging arm and Tu’ungafasi struck him in the head with his shoulder while also clashing heads with Cane. France coach Jacques Brunel at first condemned the tackle as illegal and dangerous, but later revised his view and said Grosso’s injury had been accidental. But that didn’t prevent condemnation of the incident from critics of the All Blacks around the world who say New Zealand players often display a disregard for the safety of their opponents. High tackles have been a feature of the All Blacks’ play in recent years. During last year’s test series against the British and Irish Lions, center Sonny Bill Williams became the first New Zealand player to be sent off in a test for 50 years for a dangerous high tackle on Lions winger Anthony Watson. The issue is exacerbated by a perception the All Blacks are treated more leniently by referees, citing commissioners and judicial panels than players from other nations. 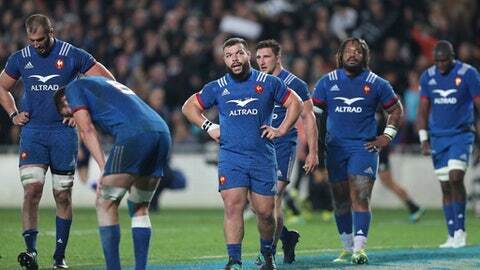 In last weekend’s first test, France lock Paul Gabrillagues was sin-binned for a high tackle on All Blacks center Ryan Crotty, though replays showed the tackle was around the chest. The match was tied 11-11 when Gabrillagues left and All Blacks took control in his absence, going on to score 44 second-half points after trailing 11-8 at halftime. Neither Cane nor Tu’ungafasi was sin-binned or cited for the tackle on Grosso, though World Rugby later issued Tu’ungafasi with an official warning. The reaction to the tackle on Grosso has eclipsed most other discussion in the week between the first and second tests. Hansen defended the tackle on the day after the match again later in the week as controversy around the incident lingered. France has been at pains this week to play down the Grosso incident, at least not to amplify any talk of retaliation. Brunel said France, after making five changes, was focused on avoiding the errors that led to its first-test defeat.